The Family Stone play a few more European festivals: Including The Glasgow Jazz Festival, Worthing Pier, and France’s renown Jazz a’ Vienne. Then the group jets to LAX for Independence Day celebrations: July 3 at Spotlight 29 Showroom in Coachella, and the 4th in Las Cruces, New Mexico. The tour continues as The Family Stone headlines Hippiefest 2015 from July 9 in Tucson, AZ through October 4 in Waukegan, IL. Other acts on the Hippiefest 2015 tour are: Rick Derringer, Mitch Ryder and the Detroit Wheels, Badfinger w/ Joey Molland. Some dates will include Felix Cavaliere’s New Rascals, the Lovin’ Spoonful, and Rare Earth’s Peter Rivera. 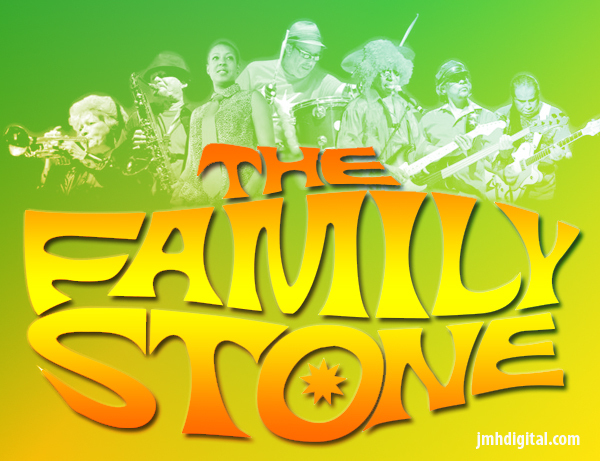 In addition to taking credit as the first-inter-racial band, with male and female instrumentalists in Rock & Roll history, The Family Stone features a new lead singer—Phunne (pronounced “Fun”), daughter of trumpet player Cynthia Robinson and Sly Stone (founder of Sly and The Family Stone). Cynthia, along with other founding members saxophonist Jerry Martini and drummer Greg Errico are leading the energetic group that has received major acclaim in rock music history. The group was inducted in the Rock & Roll Hall of Fame in 1993., were 2001 R&B Pioneer Award Winners, and inducted into the Vocal Group Hall of Fame in 2007. The Family Stone’s other members are keyboardist Alex Davis, guitarist Nate Wingfield and bassist/musical director Blaise Sison. In addition to playing Woodstock in 1969 and being one of the biggest bands in America in the late ‘60s through the ‘mid-‘70s, Sly and the Family Stone pioneered topical and social issues in the 1960s when segregation filled the United States with angst, violence, and headlines. Sly and the Family Stone sang against racism, discrimination and self-hate.